One of the bitterest herbs known. Wormwood plant is a classic vermefuge (the dried powdered flowers). The its common name a testament to it’s ability to act as a wormer in children and animals; extended use is not recommended. The oil from the leaves was used in the making of Absinthe, a toxic alcoholic drink used in 19th century France. Absinthe is now banned in most countries. An infusion of the leaves is used in the garden as an insect repellent and insecticide. An essential herb for the medicinal garden. A companion plant. Note: potentially toxic. 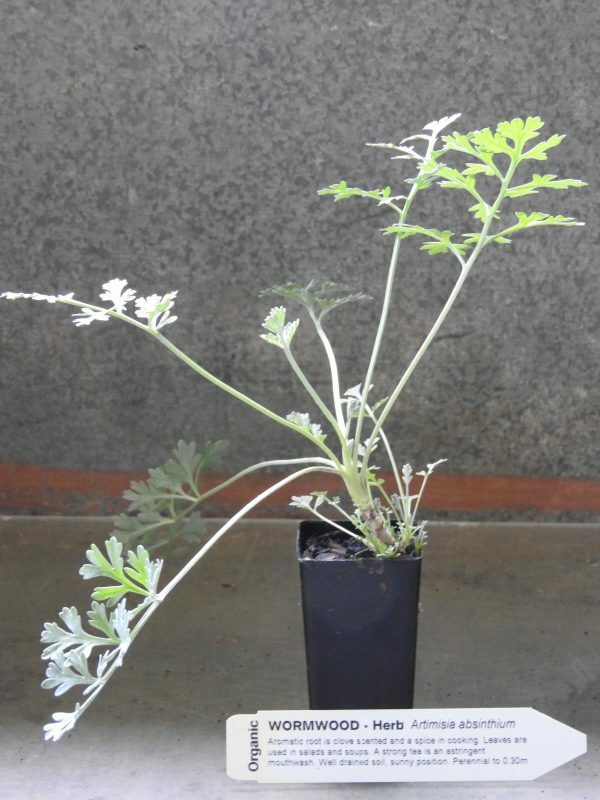 Wormwood plant, Artemisia absinthium. is native to Europe and Siberia, being adaptable to most soils and conditions. Alleopathic – discourages most other plants from growing near it. Flowers are yellowish green, occurring in panicle during summer. Drought and frost tender; will tolerate a light frost. A perennial plant, growing to 1.5m x 1.5m. Be the first to review “Wormwood, plant” Click here to cancel reply.